I was wandering around one of the last good card shops in Central Texas, and I spotted this gem sitting out there for 5 bucks. I just couldn’t pass up Derrick Johnson’s autograph on a card for that price. Sure it’s not certified and all but I trust it enough that it might be the real deal. Derrick was a monster linebacker at the University of Texas and set the college football record for forced fumbles in a season with a big, fat 9. 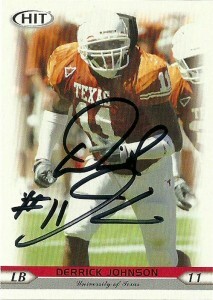 He averaged over 100 tackles in 4 years with the Longhorns, and finished his career there with 458 in 50 games. He was also credited with 10.5 sacks, 69 TFL, and 9 picks. It seemed a no-brainer that Derrick would be one of the premiere defensive players coming out of college. The 2005 draft was one that I watched intently. I knew the Texans were going to draft defensive talent, and I was confident that if the team was to add local Texas product Derrick Johnson, they wouldn’t be sorry. The Texans pick came up and Johnson was on the board. I got super exited and- they traded down. Johnson came up again and- the Texans drafted Johnson alright- DT Travis Johnson… Obviously I wasn’t enthusiastic about the team’s pick and the Chiefs stepped in with pick #15 in round one and nabbed Derrick. Derrick had a great rookie season with the Chiefs and started all 16 games at linebacker for the team, transitioning to the pro level effortlessly. His highlights include a 2009 campaign in which he recorded 2 interceptions for touchdowns in the same game, tying an already established record. In 2010, Johnson finally broke the 100 tackle barrier with 121 tackles, 1 sack, 1 pick, 4 FF, 8 TFL, and 16 pass defensed. Derrick topped his numbers again in 2011 and earned his first Pro Bowl honors with 131 tackles, 2 sacks, 2 interceptions, and 8 TFL. In 2012, Johnson ranked among the top 5 in tackles, making him an invaluable starter in IDP fantasy leagues that track tackles for points.